Import the text from files. 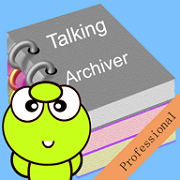 A valuable and powerful text archives manager. 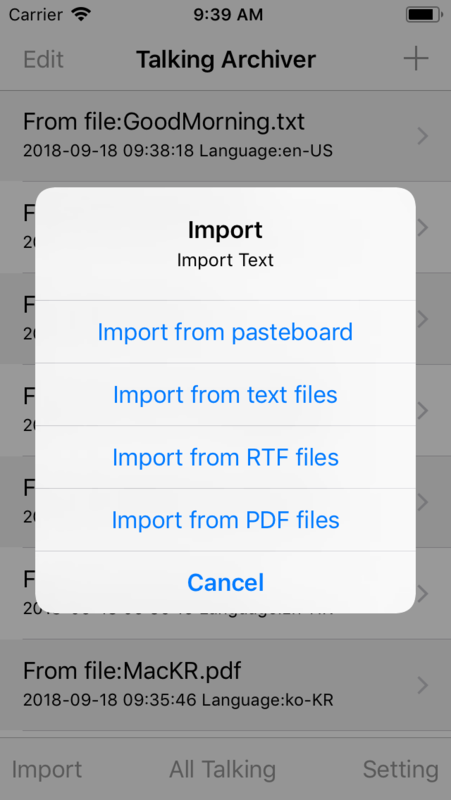 Input text from pasteboard, plain text files, PDF files, or RTF files. It could talk the text with over 30 international languages. The repeating talking all of archives could help us listen and go over our important archives. Edit the text archives, we could add some memo to our archives and update the archives where and whenever. Import the text from the PDF files. Import the text from the plain text files. 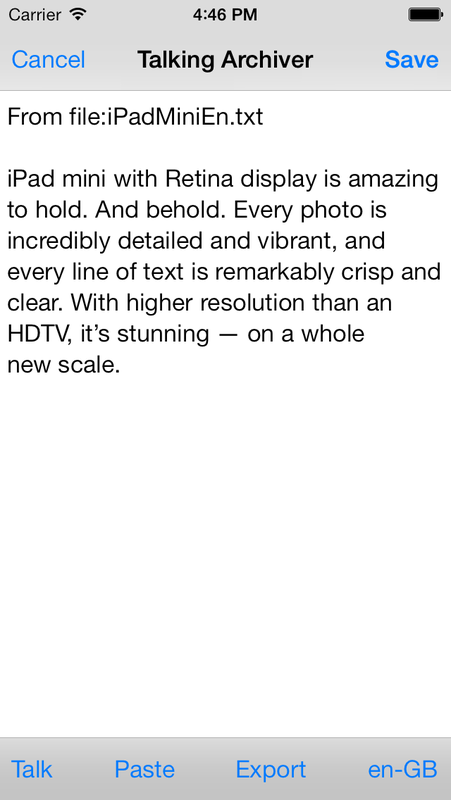 Import the text from the pasteboard. Using the iTunes File Sharing, move the files to this App folder. Export the text in this App to the text files. Paste the text to the pasteboard. Export the text in this App by sending the email. Could talk the text in more than 20 international languages. FAQ 1: What is the differences between the professional edition and the standard lite edition? The professional edition includes all the features of the standard lite edition. The professional edition needs to run at 11.0 iOS or above. FAQ 2: How to select the talking languages? In the main list view, when we tap the top right button +, the new archive view will be displayed. At the bottom tool bar, the right button is the language button. By default , the language could be en-US. 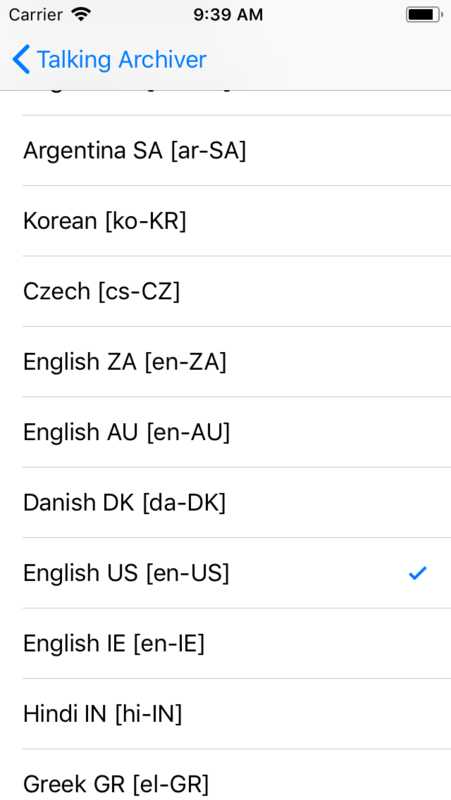 If we need to select the different languages, just tap this button, the languages list will be displayed. In the main list view, when we tap the import button at the bottom tool bar, the import menu will be displayed, when we select the imported files, the archive view will be displayed. The text in the selected file will be displayed in the text view.At the bottom tool bar, the right button is the language button. By default , the language could be en-US. If we need to select the different languages, just tap this button, the languages list will be displayed. 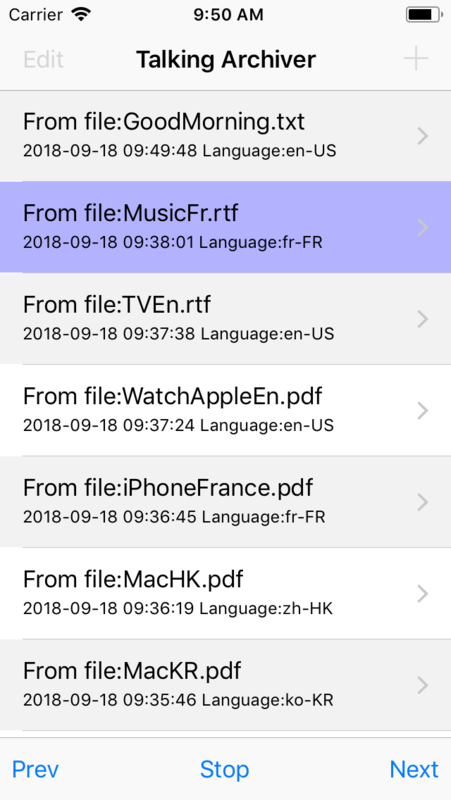 FAQ 3: How does this App recognize the type of the imported files? The current edition recognizes the file type according to the extension name of the file. For example, the extension name of PDF files should be .pdf. 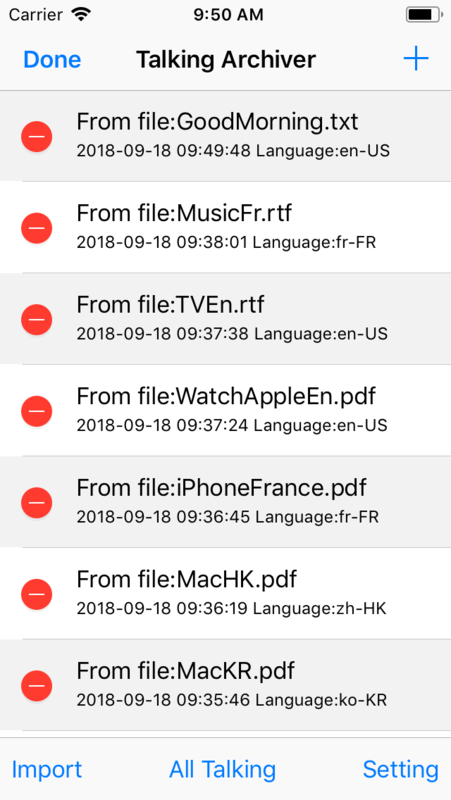 The extension name of RTF files should be rtf. The extension name of plain text files should be txt. 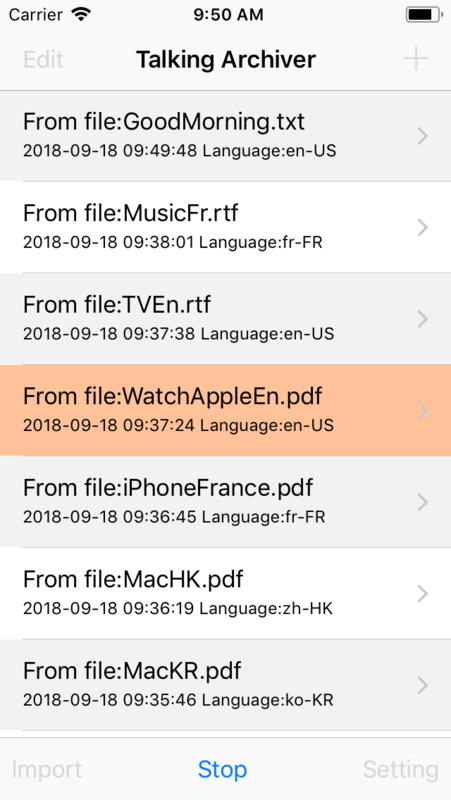 If the file has no extension name, the file list will also display its name, but the user need to know the type of this file in order to import successfully. FAQ 4 : Could this App recognize the text on the image? No. In the standard pdf files, the text and image are saved in the PDF seperately. This App will get the text string in the PDF files and do not recognize the text in the image or photos. 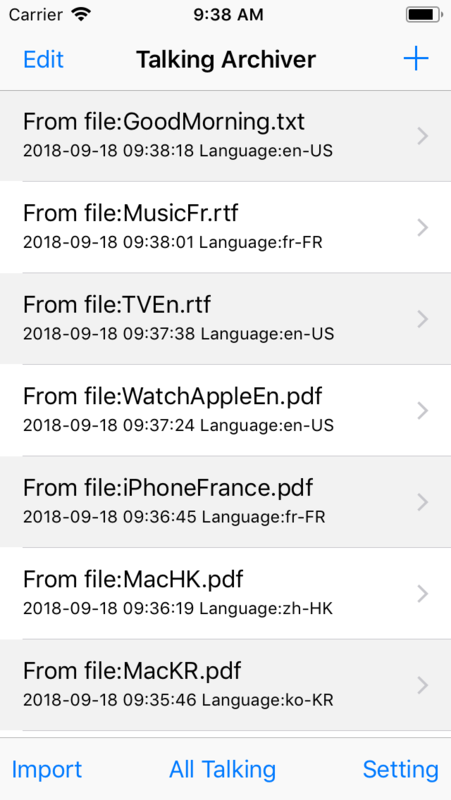 FAQ 6: How to add the files to the folder of this App? FAQ 7: How to export the text in this App? 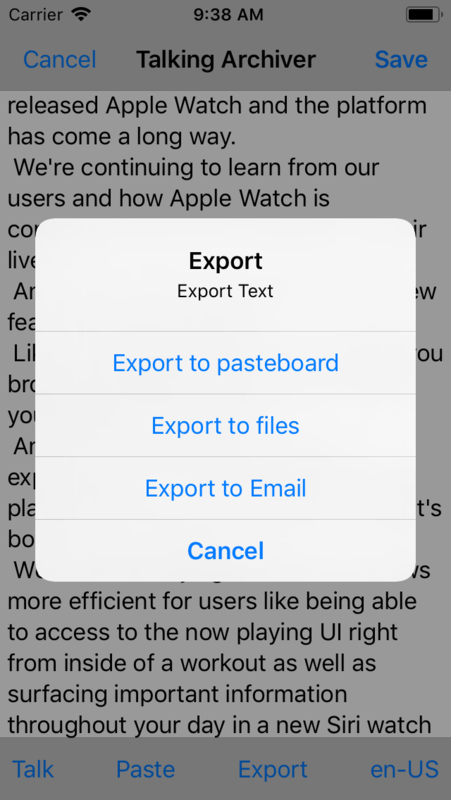 In this App, we could export the text to the pasteboard, to the text files and email the text. In the single archive view, the export button is located at the bottom tool bar. FAQ 8: How to use the long press gesture? In the main list view, long press the single table cell, the related text note will be talked repeatedly. Then the color of the talked cell will be red. At this situation, if we want the App to talk another text note, then just long press the another table cell, then the current talking will be stop. 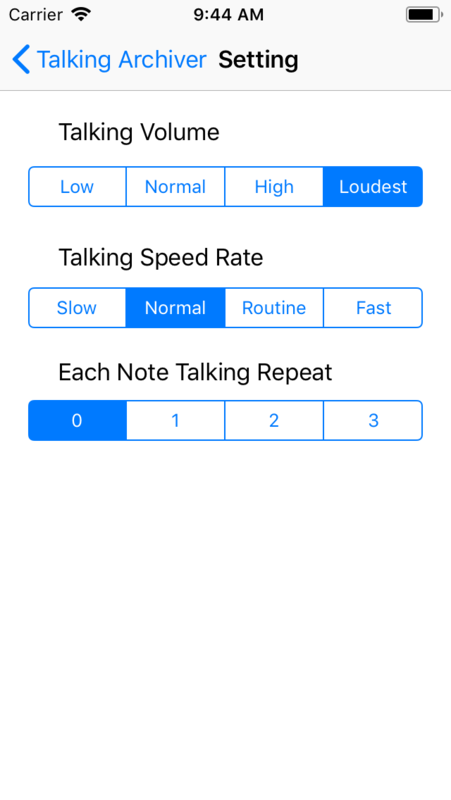 The app will immediately talk another text note. If we just want to stop the talking, please tap the stop button at the bottom tool bar. FAQ 9: How to import teh PDF file by using the professional edition? Step 2: In the main list view, tap the import button at the bottom left corner. Step 3: When the menu list is displayed, select the item about Import from PDF files. FAQ 10: Where could we find the next play button? In the main list view, if we tap the all talking button, the next button and the prev button will be displayed at the bottom tool bar. If we tap the next button, the App will skip the current talking and talk the next text note immediately. When the next button is displayed, we tap the stop button, the current talking will be stop. The next button and the prev button will be hidden.